(Scientific Name: Flammulina velutipes) A native Asian mushroom commonly found growing on tree trunks or tree roots. 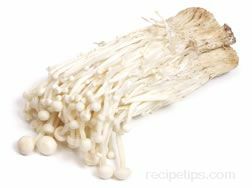 Also known as the Snow Puff, Velvet Foot and Enokitaki mushroom, the Enoki grows in long clusters of string-like stems that sprout small white caps. The mushrooms provide a mild flavor with a somewhat crunchy texture. It is a good addition to salads, soups, meat dishes, and as a garnish. The spongy base should be removed before using. To store, keep refrigerated loosely wrapped in their original container or a paper bag at 34ºF to 38ºF where they can be kept for 14 days. Do not store in plastic which can increase their exposure to humidity causing more rapid deterioration.